People are unconscious when they hold a pen, and each person has a habit. In addition, each person writes a character with a distinctive personality, but there is as much habit as that. In addition to this, what kind of things to write on what kind of paper, what kind of work will be done for the fountain pen, data of the unconscious part and consciousness into data of the order form, sharpen pen point, make adjustment, make fountain pen easy to write I started doing things. 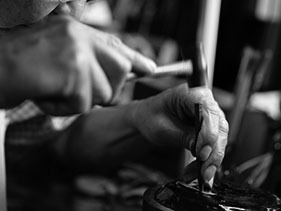 A custom made was born also for a fountain pen like a suit or a shoe. Most fountain pens, the joint between the cap and the barrel are screws. A normal screw advances only one screw thread per rotation. As it is a part that needs to be opened and closed many times a day, the technique that I thought of wanting to reduce the rotation speed is Shijo thread. It advances by four threads in one revolution. 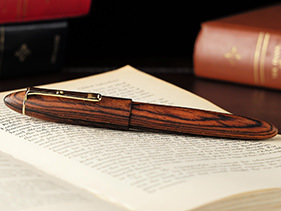 It is a technology transmitted as the production of a classic fountain pen, but now it is unusual. Besides ebonite and celluloid, it was suitable for work of cutting out, and it was black water buffalo and tortoiseshell that adopted it as a material that is still grasping and pleasant. At that time, it was an important theme that the internal mechanism and the threaded part were strongly wear-resistant and used for a long time to incorporate safe ebonite. From this point forward, we also use ebonite for all internal mechanisms such as precious wood. Even if it takes time to produce, I want to make something of high quality. Even if precious wood is used for many years, it is durable and you can enjoy aging. Some are regulated by the Washington Convention and are difficult to obtain. We are thinking that we would like to make the best choices among those available now and work. I thought that clip and ring metal fittings would like to make solid gold instead of plating treatment. Like a fountain pen, handmade rather than machine-made. Like Nib with 14K Solid Yellow Gold. All metal fittings are made by hand. Approximately 70 steps to make one clip. 6) I evolved and revived the classic instrument 70 years ago. Lathe for manufacturing fountain pens (machines indispensable for the classic fountain pen manufacturing method, machinable shaft cutting and drilling with power, those that can cut the four-threaded screws and one-threaded screws by stepping on), cutting tools specialized for thread cutting, cutting tools The foundations, the bite, all of these, were using it while repairing what I was using in the 1930 ‘s, so the limits had come. Also, there was little leftover knife. There are no craftsmen who make exclusive machines and tools in the world without craftsmans, so they do not sell anywhere. I did not have time to despair, I needed to make a new one somehow. Drawing the machine by disassembling the machine, incorporating abundant contemporary technology into the problem, and making it. While we consulted the craftsmen, all knives produced classical cutlery. It took seven and a half years. Thanks to the skills and wisdom of craftsmen and engineers, processing accuracy has also increased. It is my treasure. We made it a full custom made system that not only polish and adjust the pen point but also the total balance depending on the length of the shaft, the weight, the position of the weight. The upper part and the lower part of the cap clip. When all screws are closed, the handle will fit. This requires a truly complex and sophisticated technique. Since the screw connecting the cap and the barrel is four strands, there are four stop positions, but where to put the handle together can be enjoyed as one of the rituals. There are also such visual pleasures such as cocobolow wood and other prominent material of wood grain. There was no reply to ask the teacher about what I do not understand. There is a sound that I hear all day. Sound cutting sharp material with knife. I learned everything from the sound. Cutlery and machinery have no reserve. I asked the knife craftsmen many times to make a prototype. I evolved and reprinted the tools and machines 70 years ago with seven years. I made fountain pens more than 14 hours a day. I do not have a day off. It was three years that gave me suffering. Beauty is born only from suffering. I stole the technique thankfully for meeting the valuable people. I feel with my eyes, with my fingertips, with the sound. It was training for me how to feel “something that can not be expressed in words”. I will never forget the courage, perseverance, guts, effort, and appreciation. Well, let’s write a fountain pen letter that says “something that can not be expressed in words”. Even if it is not a good character, even though it is not a good sentence, I feel that feelings are transmitted because something that makes me feel even more than that is inhabited. It is regrettable that people’s feelings will become dull as well as becoming a convenient world. I believe that this “something that can not be expressed in words” leads to true peace of mind. 2013 As the 80th anniversary commemorative model developed and sold out only for No. 15 Bicolor Nib 100. Along with that, silver 950,14K white gold developed in the metal, sold out. 2014 More than 50% of annual order delivery will be from overseas.